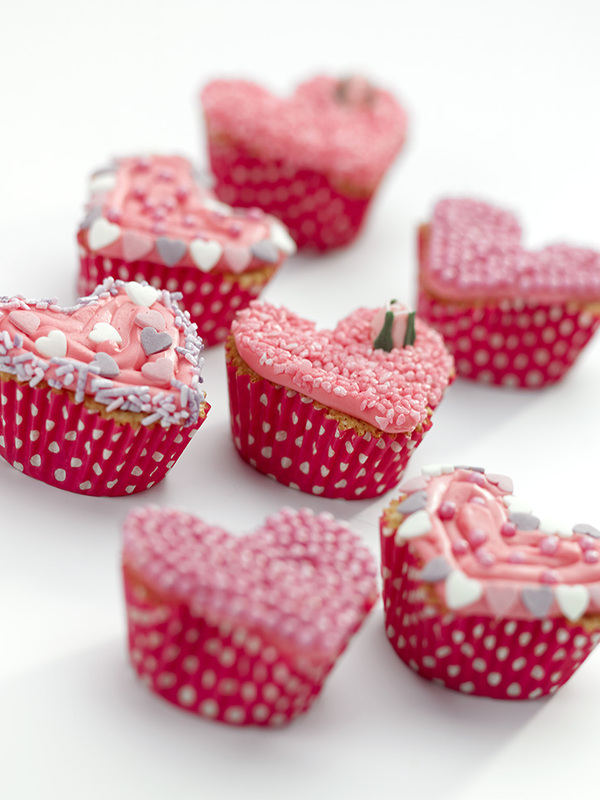 A bit last minute, but if you have time today to marshall the kids for some baking, try this fun heart-shaped cupcakes recipe. 1. Preheat the oven to 200ºC/gas mark 6. 2. Line a muffin tin with 12 cake cases. Tear off some small pieces of foil, and roll into balls about the size of a small marble. Pop one of these into the muffin tray so it gently pushes the baking case inwards at the top, forming the top of the heart. Roll two smaller balls for the sides of the heart and gently prod those down the side. If the case keeps jumping out, then do this after you have put the cake mix in the cases. 3. Cream the butter and sugar, then beat in the eggs one at a time with a little of the flour. 4. Add the vanilla extract and fold in the rest of the flour. 5. Add the milk to make a soft, dropping consistency. 6. Spoon into the prepared cake cases, equally filling them up to about 2/3 of the way up. 7. Bake for 15-16 minutes until the cakes are golden on top. Check to see if they are ready by inserting a cocktail stick into one of the cupcakes. If it comes out dry then the cupcakes are done. 8. Place the cakes in their cases on a wire rack to cool. 9. If making the butter cream yourself, mix the softened butter with the icing sugar and vanilla extract until smooth. Use some of the milk to loosen the butter cream if necessary. 10. Using a piping bag with a small star nozzle, fill it 2/3 full with the butter cream/frosting, securing the top of the bag with a freezer clip. Starting at the top of the heart, pipe from the outer edge of the cupcakes. Slowly work your way round the edge recreating the heart shape with a nice smooth line, then fill in the centre of the heart. 11. Get creative with your decorations! A quiet week this week, relatively. On Sunday we met up with the girls' Godparents to go for a lovely dog walk through the woods, then came home to do some painting and playing.